Over 77 percent of the dead are civilians. Every day brings more stories of incomprehensible anguish and loss. Ezbet Beit Hanoun, Gaza—The Abu Jarads died together. Eight of them. They were nestled into the second-floor bedroom of their family home in northeastern Gaza when the Israeli artillery shell came crashing through the wall. It was Friday evening. After Iftar—the sunset meal that marks the breaking of the fast in Ramadan—some family members headed to the local mosque, some were in the kitchen, some milled downstairs. The eight that were about to die had gathered in the bedroom to watch the popular television series Bab al-Hara (The Neighborhood’s Gate) that airs at 9 pm. They sat close to one another. Abdel Rahman and his wife, Raja, along with their two children, 6-month-old Moussa and two year-old Haneya. Abdel Rahman’s brother, Naim, and his 1-year-old son, Sameeh. And Abdel Rahman’s two other siblings, Ahlam, 15, and Summer, 13. Five of the eight are children. The bombardment came without warning. Three artillery shells in quick succession. The first struck the living room on the first floor. The second hit the bedroom. The third an adjoining family building. 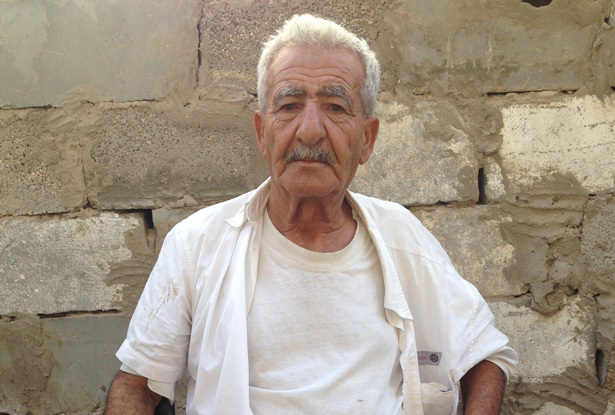 Moussa, the family elder, was napping in an adjacent room when the attack happened. He awoke to find his family massacred. He helped carry out his two sons, two daughters, daughter-in-law and three grandchildren downstairs. None of them made it to hospital alive. When asked his age, Moussa says, “I was born during the Nakba,” Arabic for “catastrophe,” the term Palestinians use for the forced expulsion of hundreds of thousands of their people during the founding of the state of Israel. “From the Nakba to the Nakba,” he says. He is 66. He says his family has no relation to Hamas or Fatah. They have a successful business. A factory that produces cement bricks for building and two trucks. “We never fired even one bullet,” Moussa says. The Abu Jarads were killed on July 18, the first day of Israel’s ground offensive into Gaza, Day 11 of a brutal assault that has left over 340 Palestinians dead and more than 2,500 wounded. Israel has attacked Gaza incessantly from the air, land and sea. Drones, F-16s, Apache helicopters, naval warships, tanks and artillery guns have bombarded the Strip day and night. More than 77 percent of the dead are civilians, over seventy of them children. The Abu Jarad family home lies on the western outskirts of Beit Hanoun, close to the Israeli borders to the north and east. The area has been heavily shelled by the Israeli military. Destruction is everywhere. Gaping holes have been torn into buildings and there are craters in the ground left by missile strikes. The streets are deserted and tense. Israel has vowed a “significant expansion” of its ground offensive. Beit Hanoun and nearby Beit Lahia have already been largely emptied of residents. The United Nations says the number of internal refugees has more than doubled since the start of the invasion, to at least 50,000. The Abu Jarad family has no plans to leave. Behind the house, rubble and bits of woods that were blown out of the first and second floors are scattered on the ground next to a mangled refrigerator. A plastic teat from a baby bottle lies in the dust. The smell of burning lingers in the air and smoke wafts out of one of the blacked rooms still smoldering from the night before. Inside the bedroom where the eight were killed, clothes, torn up wooden cabinets, and the remains of a bed are strewn ankle high across the floor. The debris of life. A massive hole in the wall made by the incoming shell lets in the light. Through it, Israel is visible on the eastern horizon beyond clusters of small trees and the low lying concrete buildings of Beit Hanoun. After the bodies were carried out of the bedroom, Moussa didn’t tell his wife, Saadeya, they had been killed until the next morning. She thought they lay wounded in the hospital. He told her at 9:30 am on Saturday so he could take them to be buried. She had a nervous breakdown. 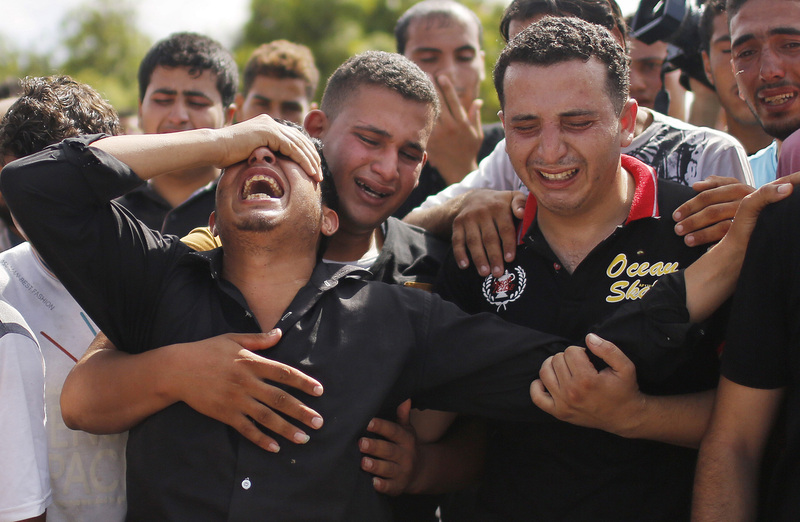 Moussa cries when he says it, the only time his grief penetrates through the shock. Every day brings more death. More stories of incomprehensible anguish and loss.